ALVELEY PATIENT GROUP NEEDS YOU! 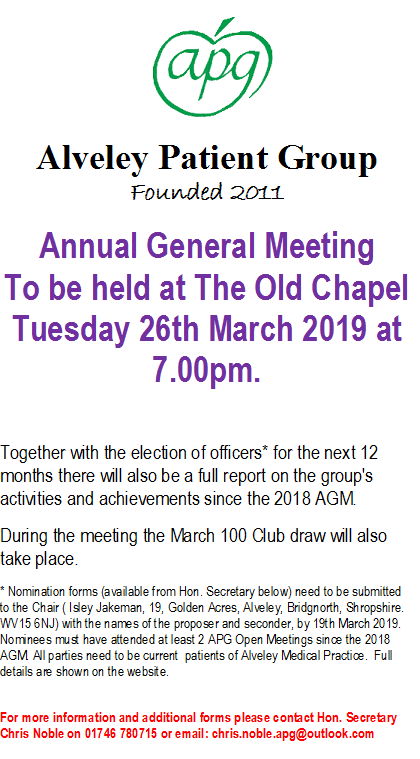 Alveley Patient Group (APG) was founded in 2011 and their 8th Annual General Meeting takes place at the Old Chapel on the 26th March at 7.00 pm. 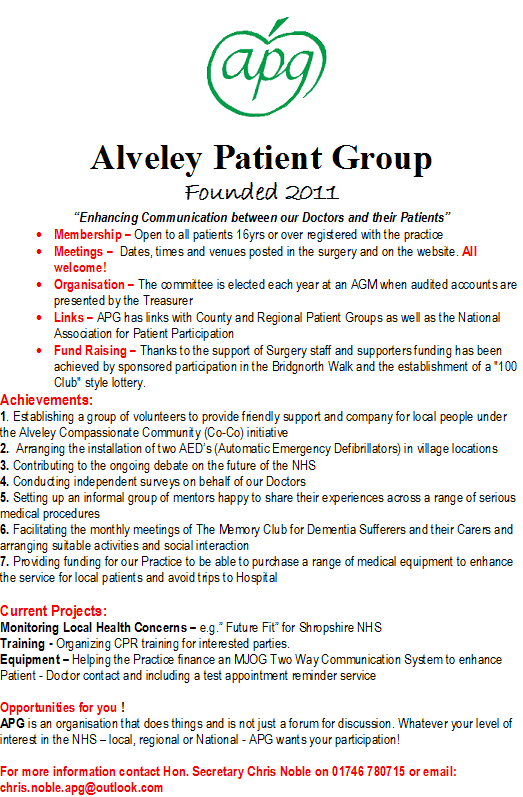 Their mission statement has always been "Enhancing communications between our doctors and their patients" and everyone who is a patient of the Alveley Medical Practice has automatically become a Patient Group member. Being a member entitles you to opt in to receive by email the monthly report from the National Patient Group organisation and local and countrywide news about new health developments. All our meetings now have an open forum section to bring local and national health concerns to the fore. APG also has a voice on the Shropshire Patient Group, which represents all 41 of the County G P Practices and meets to discuss more local health matters. It is essential that we participate in the National and Regional debates over the future of the NHS. IF we do not contribute to the discussions we can have no complaint if our future medical needs are ignored. Over the last 8 years the Patient Group have organised regular events. For example our MP Philip Dunne came and addressed a full Village Hall about "Future Fit" and it's effect on our two Shropshire Hospitals. CPR Training has been organised as well as a demonstration evening on the fitness equipment on the Rec. Speakers have been organised to give talks on Medical issues etc. The Patient Group took the lead in establishing the Village CoCo scheme, the purchase and installation of the two emergency defibrillators in the Village. A contribution to help residents buy and AED in Romsley has also been agreed. We have established the "Memory Cafe", a monthly meet and activities afternoon for dementia sufferers and their carers. In our early meetings with our Doctors it was realised that many patients were having to go to distant hospitals for simple checks that could be carried out at our Practice if the equipment was available. This was the trigger that pushed the fund-raising activities of the group and led to the establishment of the 100 Club in 2014. Consequently we have been able to improve the patient experience at our Practice by providing amongst other things 24 Hour B P machines and an ambulatory ECG, a Doppler Machine, a fully automated beds for the treatment rooms, an Asthma diagnostic machine, a Cauterising machine, new wheelchairs not to mention financing the water fountain in the waiting room and helping with costs of the new text messaging service which is proving so beneficial. We also participated in the refit of the dispensary by purchasing a set of Dispensary Draws and further purchase are being planned. Since 2011 the organising committee has remained broadly the same as no one else has come forward to participate. Sadly the committee has shrunk over the last few years and now the elected officers are carrying out multiple roles which is not a satisfactory position for any organisation. Dr Abbots and Dr Riley, together with Practice Manager Lindsey Clark greatly value the support and feedback they receive from APG and are anxious to see it continue in its current format. With some existing officers of the Committee moving on or having to retire from participating, new volunteers are needed to come forward urgently to save, what is a Village asset, from withering away. Anyone who is interested in taking on a position on the APG Committee or being an active member of the group please contact Isley Jakeman on 077902016425 or email her on jakemanisley@gmail.com as soon as possible. The more people who come forward the lighter the load!